This is the second half of a special Reverb Nation Guide To Music Theory. In Part 1, I taught you how to build and understand intervals and basic chords. If you haven’t gone through Part 1 one of this guide, stop reading this and check that out first. To understand everything in this article, you’ll need to have a basic knowledge of everything I talked about in that first guide. In this article, I’ll introduce you to scales, Roman numeral analysis, and the circle of 5ths. Having a solid grasp on music theory’s basic concepts can be a huge help to you no matter what your unique experience and background in music is, and by the end of this guide you should have more than enough information to be able to wrap your head around the ideas that govern music. Let’s jump back in. Scales, which are also referred to as modes, are step-by-step sequences of notes that explore keys in music. If your piano or guitar teacher taught you how to play scales without explaining the theory behind them, you might be under the impression that scales are nothing more than finger exercises, but they’re much more important than that. Major and minor scales provide the unique sets of notes found in most of the chords we hear in popular music. Memorizing a few basic patterns will allow you to play and understand scales in any key on your instrument. And just a reminder, we’re using the keyboard here as a visual guide, but it’s important to apply the information in this article to your instrument. There’s a bunch of musical modes to learn and explore out there, but for the purposes of this guide we’re only going to look at the major and natural minor scales. Major scales provide the unique sets of notes found in major keys. We’ll use a pattern of major and minor 2nd intervals to learn how to build major scales anywhere in music. Starting with the C major scale makes the most sense because it doesn’t include any accidentals (black keys). Once you’ve got a good idea of how to build the C major scale, start testing your knowledge by using the pattern above to build major scales in other keys on your instrument. For example, if you apply this same pattern of intervals and build the major scale on the note of G, you should end up with the notes G-A-B-C-D-E-F#-G. There are three minor scales in music: natural, minor, and melodic. We’re going to focus on natural minor scales because they’re used to build the minor keys we hear in music. If you were to build a scale starting on the A note in the C major scale, you’d end up with an A natural minor scale. Like you did with the major scale pattern, test your knowledge by building natural minor scales in a few different keys. With these simple patterns you now have an easy way to build major and natural minor scales in any key in music. Pretty neat, right? This scale-building knowledge is great for writing, improving and understanding music. I totally realize how frightening of a term like Roman numeral analysis is, but don’t go crazy and pour beer on your laptop just yet. It’s actually not too difficult of a concept to wrap your head around. The keys we hear in music are built with the notes found in major and minor scales. For example, all the chords we hear in the key of C major are built using the notes from the C major scale. Like with intervals and scales, the note-to-note relationships within keys are permanent. This means that order of chords within keys never change. We’re going to combine our knowledge of basic chords with what we’ve learned about major and minor scales to figure out how the chords in keys work. I used the good old key of C major here as an example because it’s easy, but again, the note-to-note and chord-to-chord relationships of these keys are permanent, so you can and should apply this knowledge to any major key in music. For practice, I recommend playing the scale of a key first before attempting to play through each of its chords. You now have the knowledge of how to build intervals, chords, scales and keys on any note in all of music. That’s hugely powerful stuff, but things can get a little difficult to understand in music theory because the relationships between chords sound so similar no matter what key you’re playing in. That’s where Roman numeral analysis comes in. Roman numeral analysis is used to identify the permanent relationships between chords within keys. For example, when you hear a song in the key of C major that uses a chord progression of C major and F major, we’re much more likely to be able to identify and remember the unique sound of the relationship between the chords rather than the individual notes themselves. The listener hears that song and hears a 1 to 4 chord progression, not a C major chord moving to an F major chord in the key of C. There are absolutely musicians out there with perfect pitch who are able to discern the differences between notes, but the vast majority of us interpret music through its broader relationships between chords out of the context of keys. Again, the size of the symbol determines whether the chord it’s representing is major or minor, and the degree symbol next to the seventh chord at the end means that the chord it’s representing is diminished. You can use this system of Roman numerals to not only understand chord progressions in music, but to communicate your own musical ideas. The circle of 5ths is a handy visual guide that helps us make sense of how keys work in music theory. We can learn to identify different keys by looking at their unique key signatures, which are comprised of the unique number of flats and sharps found in each key. And just in case you’re confused, flats and sharps, which are also called accidentals, make up the black keys you see on the keyboard. Sharps raise notes by a half-step while flats lower them by the same amount. The keys of C major and A minor don’t have a key signature because they don’t include any accidentals. The circle is split up between keys with flats and sharps. 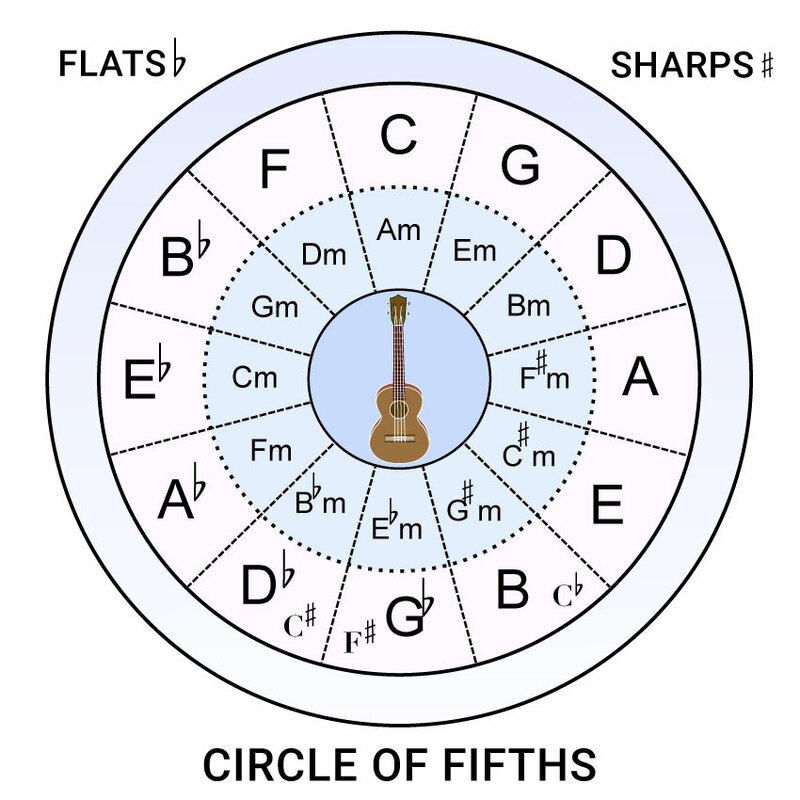 The outside of the circle is comprised of major keys and the relative minor to each major key is on the inside of the circle. Moving clockwise and starting with the key of C major, each key moves up a 5th and gains a sharp. Each added key keeps the old sharp and adds a new one located on a note called the leading tone, which is a scale’s seventh degree located the note right before the octave. For example, the key of G major’s sharped note is F#. The sharp side of the circle ends with the key of F#, which can also be interpreted as Gb. The left side of the circle works in a similar way, but the major difference is that the added accidental for each new key is located on the fourth scale degree instead of the seventh. For example, the key of F major’s added accidental is Bb. If you’re ever confused about the way keys work, this is a great visual guide to help you get your bearings. Well, that about wraps up this special music theory guide. There’s so much more to learn and talk about when it comes to the theory behind music, but what we’ve covered here is more than enough to get you started. In order to truly absorb all the information in this guide, you’ll have to do the unsexy work of building intervals, scales, chords and key signatures on paper. While that sort of work is tedious, it’s mandatory if you want to firmly internalize the concepts behind music theory. In order to fully understand and appreciate music through a theory context, you’ll have to memorize things like the circle of 5ths and how to build chords, but once you’ve put in the work, you’ll begin thinking about music in a completely new and connected way.